Well, the old law of supply and demand is kicking us again this year with our sweet corn. We have a beautiful crop, good yields, and prices that are below our break even costs. 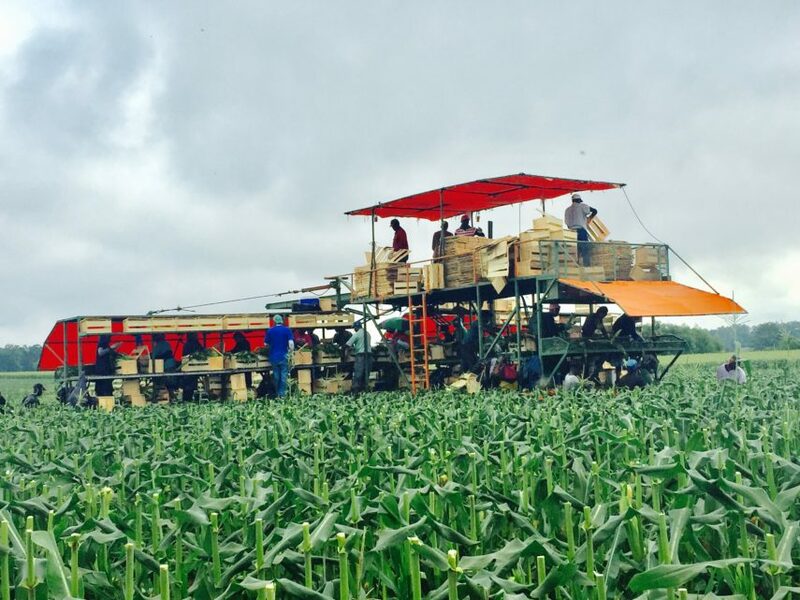 The guys in South Florida have a functioning sweet corn exchange. They set a price which returns a profit. If they fail to get that price, they do not harvest the corn unless their price is met. Simple math has proven that they can leave 25% of their crop in the field unharvested while selling the remaining 75% at a dollar or two higher, and make more money that way. Sadly, what we have up here in South Georgia is a lack of trust among the 26 or so growers. Everyone thinks that everyone else is selling their corn cheaper; so we slowly drift to the lowest common denominator price. The only solution is to increase demand; so please everyone go buy more sweet corn today. It is really good eating! However, what I really wanted to write about today after coming back from the field is how hard these folks who are harvesting this corn work. It is a really hard job hand picking and packing the corn. We have had zero luck with finding any local labor who are willing to perform these tasks, and we have tried. I am convinced that the men and women whom I grew up with in my youth could have performed these jobs which got me to thinking. I, along with a lot of folks, grew up topping suckering, picking and hanging tobacco. We also spent many back breaking days pulling weeds out of peanut fields from dawn to dark. Thanks to technology, chemicals, and mechanization, those jobs don’t exist anymore. We certainly can’t afford to put a teenager on a half million dollar piece of equipment that has so many GPS, computer, and other gear that it looks like the cockpit of an airplane. So where are our young people going to learn the value of hard work? Flipping burgers ? I’m convinced that the hard lessons in life that I learned in Pop’s fields convinced me of the value of an education, but those jobs no longer exist. I don’t know the answer, but we have to teach our young folks the value of hard work. Then maybe they will work harder to get an education because they will not want to work at these types of jobs for the rest of their lives. On an upbeat note, we are receiving beneficial rains, and our woods and food plots have never looked better. We are also spending a lot of time and money in dog training, more than I ever did when I was running the company. I still believe that the English Cockers are getting preferential treatment when it comes to lodging. I would not be surprised to see our pointers and setters bring a class action lawsuit against them and us. There are enough lawyers out there now that this could happen. Let me close with a short quote by an unknown author that touched my heart:” Someone remembers, someone cares, your name is whispered in someone’s prayers”. All of us at Riverview care about you, our guests, and we do pray for you and your families. I hope you are having an enjoyable, gnat free summer. If not, we have a few trillion to spare!